This paper discusses concentrations of 7 essential trace metals (chromium,cadmium, copper, lead,nickel, manganese and zinc) in water, sediment and freshwater fish (Clarias. gariepinus) tissues from Oke-Afa Canal, Lagos Nigeria The sampling and analysis of the samples from Oke Afa canal were carried out between the month of June-October, 2011 and experimental procedures used followed the description of American Public Health Association (APHA) The results showed that Liver concentrated highest level of zinc, copper and lead (6.851±0.005 mg/Kg, 1.876±0.001mg/Kg and 0.143±0.001mg/Kg respectively). This was followed by sediments with mean values of (nickel = 0.400±0.001mg/Kg, chromium-=0.127±0.003mg/Kg, mn =0.092±0.001mg/Kg and cadmium= 0.076±0.003mg/Kg). Surface water equally concentrated some metals such as Manganese, cadmium and lead with mean values of 0.069±0.101Mg/L, 0.043±0.011Mg/L, 0.039±0.016Mg/L respectively. Metal concentration in the fish tissues (flesh, bones gills and guts) was low in concentration, but the values were still significant at 95 percent confidence limit (P< 0.05) with the exception of Manganese. This suggest that the water quality of Oke Afa canal system is adversely affected and impaired by the discharge of domestic, agricultural and industrial wastes. Comparison of these values with FAO/WHO limits in fish tissue showed that it is safe to consume the fish species from Oke -Afa canal for now but may be unsafe due to possible bioaccumulation of the metals in the organs of man since humans are at the top of food chain. Abel, P.D. (1989). Water Pollution Biology.Ellis Horwood Publishers, Chicher. 231pp. Adami, G. M.; Barbieri, P.; Fabiani, M.; Piselli, S.; Predonzani, S.; Reisenhofer, E., (2002). Levels of cadmium and zinc in hepatopancreas of reared Mytilus galloprovincialis from the Gulf of Trieste (Italy). Chemosphere, Vol.48, No.7, pp.671 – 677. Adams, S.H. (1990) Status and Use of Biological Indicators for Evaluating the Effects of Stress on Fish. In: Biological Indicators of Stress in Fish. (Edited by S. M. Adams), American Fisheries Symposium 8: 1 - 8, Bethesday, Maryland. Awofolu OR, Mbolekwa Z, Mtshemla V, Fatoki OS (2005) Levels of trace metals in water and sediments from Tyume river and its effectson an irrigated farmland. Water SA., Vol.31, pp.87-94. Basa, Siraj, P.; Usha Rani, A., (2003). Cadmium induced antioxidant defense mechanism in freshwater teleost Oreochromis mossambicus (Tilapia). Eco.Toxicol.Environ.Saf., Vol.56, No.2, pp.218 – 221. Boyden, C. R.; Aston, S. R.; Thornton, I., (1979) Tidal and seasonal variation of trace elements in two Cornish estuaries.Estuarine Coast Mar. Sci., Vol.9, No.3, pp.303-317 (15 pages). Brown, V., Shurben, D., Miller, W. and Crane, M. (1994). Cadmium toxicity to rainbow trout Nocorhynchus mykiss Walbaum and brown trout Salmo trutta L. over extended exposure periods.Ecotoxicity and Environmental Safety. Vol.29, pp.34-46. Canli, M., (1995). Natural occurrence of metallothionein like proteins in the hepatopancreas of the Norway lobster Nephrops Norvegicus and effects of Cd, Cu, and Zn exposures on levels of the metal bound on metallothionein. Turk. J. Zool., Vol.19, pp.313-321. Clarkson, T. W., (1998). Human toxicology of mercury. J.Trace. Elem. Exp. Med., Vol.11, No.2-3, pp.303-317. Dickman, M. D.; Leung, K. M., (1998) Mercury and organo chlorine exposure from fish consumption in Hong Kong. Chemosphere, Vol, 37, No.5, pp.991-1015. Enk, M .D and Mathis, B. J. (1977) Distribution of Cadmium and Lead in a Stream Ecosystem. Hydrobiologia, Vol. 52, pp.153 – 158. ETPS, (1995): Environmental testing of pollution status in Lake Temsah, Abu-Attwa water environment on fisheries resources, The Environmentalist, Vol.23, No.4, pp.297-306. F.E.P.A. (Federal Environmental Protection Agency). (2003); Guidelines and Standards for Environmental Pollution Control in Nigeria. 238pp. Farkas, A., Salanki, J.; Specziar, A., (2002) Relation between growth and the heavy metal concentration in organs of bream Abramis brama L. populating lake Balaton. Arch. Environ. Contam.Toxicol., Vol.43, No.2, pp.236-243. Ferguson, H. W., (1989). Systematic pathology of fish. Ames. : Iowa State University, Press. Filipovic, V.; Raspor, B., (2003) Metallothionein and metal levels in cytosol of liver, kidney and brain in relation to growth parameters of Mullus surmuletus and Liza aurata.From the eastern Adriatic Sea. Water Res., Vol.37, No.13, pp.3253-3262. Förstner, U.; Wittman, G. T. W., (1983) Metal Pollution in the Aquatic Environment. Springer Heidelberg., 486. Gbem T.T, Balogun J.K, Lawal F.A, Annune P.A.(2001). Trace metal accumulation in Clarias gariepinus (Teugels) exposed to sublethal levels of tannery effluent. Sci Total Environ. Vol.23, No.271(1-3), pp.1-9. Idodo-Umeh, G. (2000) Freshwater fishes of Nigeria (Taxonomy, Ecological Notes, Diet and Utilization). Idodo-Umeh Publishers, Benin City, Nigeria. Ikem A, Egiebor NO, Nyavor K (2003) Trace elements in water, fish and sediment from Tuskegee Lake, South eastern U.S.A. Water, AirSoil Poll., Vol.149, pp.51-75. Jennings G.D and Sneed R.E (1996). Nitrate in drinking water, North Carolina Cooperative Extension Service, Publication Number: AG pp. 473-474. Lee, H.S., Hwang, P.P. and Lin, H.C. (1996) Morphological changes of integumental chloride cells to ambient cadmium during the early development of the telecast, Oreochromis mossambicus. Environ. Boil. Of Fishes. Vol.45, pp.95-102. Luoma, S. N.; (1990). Processes affecting metal concentrations in estuarine and coastal marine sediments. Heavy metal in the marine Environment., CRC press., Boca Raton, FL, pp.51-66. Melancon, M.J. (1995) Bioindicators Used in Aquatic and Terrestrial Monitoring. In: Handbook of Ecotoxicology. (Eds. D.J. Hoffman, B.A. Rattner, G.A. BuKirkhan. M. B. 1983., Jr. and J. Cairns, Jr.), Lewis Publishers, London, pp. 220 – 240. 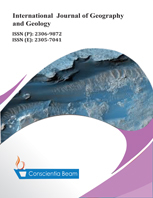 Nadia, B. E.; Badr Anwar, A.; El-Fiky Alaa R.; Mostafa, Bandr A.; Al-Mur., (2009) Metal pollution records in core sediments of some Red Sea coastal areas, Kingdom of SaudiArabia. Environ. Monit.Assess., Vol.155, No.1-4, pp.509-526 (18 pages). O.J. Aderinola, E.O. Clarke, O.M. Olarinmoye, V. Kusemiju and M.A. Anatekhai, (2009) Heavy Metals in Surface Water, Sediments, Fish and Perwinklesof Lagos Lagoon. J. Agric. & Environ. Sci., Vol.5, No.5, pp.609-617. Olaifa, F. G.; Olaifa, A. K.; Onwude, T. E., (2004) Lethal and sublethal effects of copper to the African Cat fish (Clarias gariepnus). Afr. J. Biomed. Res., Vol.7, pp.65-70. Rehwoldt, R. and Karimian-Teherani, D. (1976) Uptake and effect of cadmium on zebrafish.Bulletin of Environmental Contamination & Toxicology. Vol.15, No.4, pp.442-446. Tort, L.; Torres, P., (1988) The effects of sub lethal concentration of cadmium on hematological parameters in the dog fish, Scyliorhinus Caniccula. J. Fish. Biol., Vol.32, No.2, pp.277-282. TYLER G (1972) Heavy metals pollute nature, may reduce productivity. Ambio Vol.1, No.2, pp.52-59. Walker, D.J. ; Hurl, S. (2008) The reduction of heavy metals in a storm water wetland.Ecological Engineering, v. 18, p. 407-414, 2002.Adefemi S O, Asaolu S S and Olaofe O, Res J Environ Sci., Vol.2, No.2, pp.151-155. Waqar, A., (2006) Levels of selected heavy metals in Tuna fish.Arab. J. Sci. Eng., Vol.31, No.1A, pp.89–92. WHO (World Health Organization) (1985) Guidelines for drinking water quality.Vol. 1. Recommendations, W.H.O. Geneva. 130pp. Yong, R.N. ; Mohamed, A.M.O. and Warkentin, B.P. (1992) Principles of contaminant transport in soils. Developments in Geotechnical Engineering, 73.Elservier Science Publishers B.V Amsterdam.The Netherlands 327pp. Yousuf, M. H. A.; El-Shahawi., (1999) Trace metals in Lethrinuslentjan fish from Arabian Gulf: Metal accumulation in Kidney and Heart Tissues. Bull. Environ. Contam.Toxicol., Vol.62, No.3, pp.293-300. Yusuf KA, Osibanjo O (2006) Trace metals in water and sediments from Ologe lagoon, southwestern Nigeria. Pak. J. Sci. Ind. Res., Vol.49, pp.88-89.